Dungeons and dragons for dogs, maybe? Either way, your dog will love these plush Dragons Go Dog Toys. 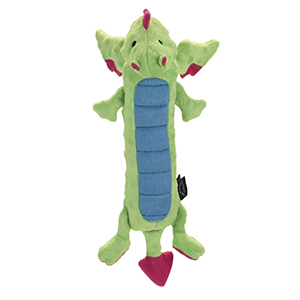 As a popular dog toy, the Dragons Go Dog Toys feature bubble plush and Chew Guard Technology but the best part is the minimal stuffing that gives these toys a fun ‘floppy’ feel. Plus they also come with puncture resistant squeakers. What more could you want for your best friend! Furthermore, these toys are designed with added durability to help withstand tough chewers. It is important to remember that no dog toy is completely indestructible but these will certainly last longer than most plush toys. What is Chew Guard Technology? It is a manufacturing process that adds a super tough, durable liner to soft plush toys! Specifically engineered to withstand tough play, all the seams are double stitched and reinforced. Part of the GoDog brand by Quaker and Worldwise, these fun loving toys are perfect for dogs of all breeds and sizes.